>>> news corp . executive rupert murdoch is back in the u.s. as his phone hacking scandal widens. martin fletcher has the latest from london. martin? >>> good morning. after the high drama of the past week here, today, media, police, government, are all licking their wounds while promising to find out who knew what and when. while rupert murdoch is assessing the damage to his empire. murdoch looked happy to be hope after tuesday's grilling by parliament members. a new york welcome. >> the slap heard across the world as for britain's parliament, the getting to the bottom of the phone hacking scandal, they've gone on summer recess. but it isn't over for rupert murdoch by a long shot. >> the long-term effects are difficult to see, mistakes were made. it cost him a lot of money. >> reporter: it may cost hem a lot more. the biggest pension fund in the u.s. called for a reform of news corp . but their support from the biggest inside investor, a saudi prince , who owns 7% of news corp . he said the company remaybes, get, a valuable and long-term investment. as to the glimpse to the murdoch marriage provided by the leak, a interview on chinese tv revealed more on how they met. >> she interpreted more for me as we went around china. who wouldn't fall in love with a beautiful woman like that. >> murdoch 's marriage grabbed the headline but no one is under any illusion that the substance hasn't changed. the empire is threatened by the deepening british investigation. natalie? >> just the beginning of all of the questions. martin fletcher in lob dndon for us, thank you. 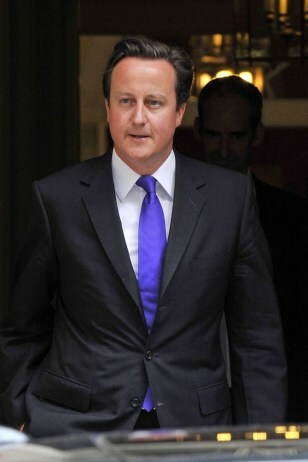 British Prime Minister David Cameron departs his home at 10 Downing Street for parliament in London, Britain, 20 July 2011.